Liturgy | In Domino Spera! Abbey church of Westminster Abbey, Mission, BC. Sacred art — music, architecture, paintings, furniture, etc. — isn’t for it’s own sake; it’s always subservient to the Liturgy and to the Faith. It’s purpose is to help us enter more deeply into prayer, to raise our hearts and minds to contemplate the mysteries of God, and to teach us about the Faith. Hence, the nature and purpose of the Liturgy is the measure by which any work of art is evaluated in order to be called ‘sacred’. These works of art should seek for noble simplicity rather than sumptuous display (no. 124). As the current General Instruction for the Roman Missal explains, the nobility and beauty of vestments, furnishings and art are found more in the quality of their materials and construction than in their outward decoration (see no. 344). The sacredness of these objects comes from their use, not their beauty or value. Nevertheless, these objects should reflect the beauty and value of the sacred actions for which they are used. Therefore, the laws that govern the provision of material things involved in sacred worship are to be revised (no. 128). Especially those that refer to the worthy and well planned construction of sacred buildings, the shape and construction of altars, the nobility, placing, and safety of the eucharistic tabernacle, the dignity and suitability of the baptistery, the proper ordering of sacred images, embellishments, and vestments (no. 128). The Council Fathers also insisted that the use of sacred images in churches for the veneration of the faithful be maintained, but that their number should be moderate and their relative positions should reflect right order. For otherwise they may create confusion among the Christian people and foster devotion of doubtful orthodoxy (no. 125). Sacred images are praiseworthy and useful to the faithful, but they’re not more important than the sacred mysteries celebrated in church. There shouldn’t be multiples of the same image (i.e., only one image of Divine Mercy), and there’s a hierarchy among the images themselves: images of our Lord are of the highest importance, then those of Mary and Joseph, then those of the other Saints. Titular or patronal Saints should have a greater importance than other Saints. In the same way, it wouldn’t be logical for the Priest’s chair to be larger and more elegant than the Altar. 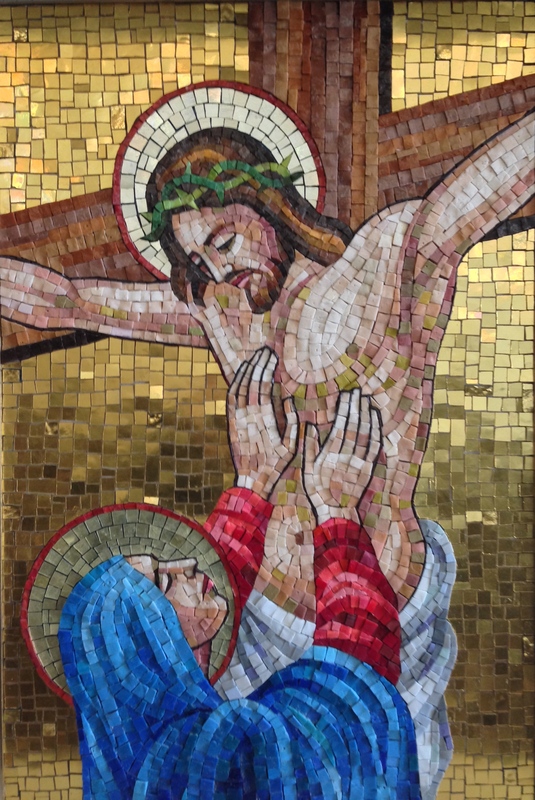 Station IV – Jesus Meets His Mother, Chapel of St. Joseph Seminary, Edmonton, AB. Consequently, it’s desirable that schools or academies of sacred art should be founded… so that artists may be trained. For, prompted by their talents, [and] desire to serve God’s glory…, [they] should ever bear in mind that they are engaged in a kind of sacred imitation of God the Creator, and are concerned with works destined to be used in Catholic worship, to edify the faithful, and to foster their piety and their religious formation (no. 127). 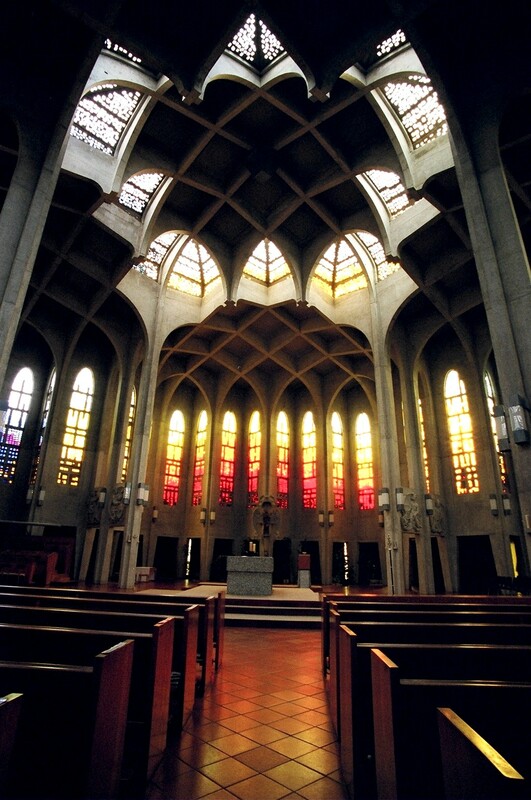 Seminaries are also to include courses about the history and development of sacred art, and about the sound principles governing the production of its works, so that Priests themselves will be able to appreciate and preserve the Church’s venerable monuments, and be in a position to aid, by good advice, artists who are engaged in producing works of art (no. 129). This concludes our review of the Constitution on the Sacred Liturgy, the sacred Council’s first document, and perhaps the one that has most impacted our lives since. Having described the history, beauty and intent of the Divine Office, the Council Fathers proceeded to call for some changes that would make the Office that would make it easier for the clergy who don’t live in community, or for those who were more active in an apostolate (cf. no. 89). This was also to ensure that the various Hours would be said at their proper time (no. 94). 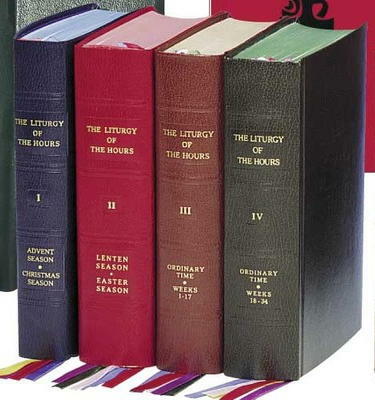 The Liturgy of the Hours is divided into four tomes, often called a ‘Breviary’. “Lauds as morning prayer and Vespers as evening prayer are the two hinges on which the daily office turns; hence they are to be considered as the chief hours and are to be celebrated as such” (no. 89a). Night prayer, or Compline, was to be recomposed to reflect it’s proper place at the end of the day (no. 89c). While it is a duty for clergy and religious to pray the Divine Office, it is important that they remember that it “is a source of piety, and nourishment for personal prayer”, therefore those who pray the Offices are “earnestly exhorted in the Lord to attune their minds to their voices when praying it” (no. 90; cf. no. 99). In other words, the Divine Office isn’t a book to be read, but a proper Liturgy that is prayed with heart and mind. Flowing from this, the Fathers also asked that the books be recomposed according to a longer cycle of Psalms (instead of the one-week cycle then used), so that more Psalms could be prayed (no. 91). The current Divine Office contains all 150 Psalms, using each of them at least once over a four-week cycle. With this, the Fathers also asked that the Scripture readings for each Hour be expanded to include longer texts and a greater selection (no. 92a). “Readings excerpted from the works of the fathers, doctors, and ecclesiastical writers shall be better selected” for use in the Office of Readings, again to have a greater selection of texts that nourish the prayer and faith of those who pray (no. 92b). And the “accounts of martyrdom or the lives of the saints are to accord with the facts of history” (no. 92c). Likewise, the hymns are also to be changed so that “whatever smacks of mythology” or doesn’t agree with true Christian piety is to be removed (no. 93).